We use a wholistic approach to build custom advertising solutions for our clients. Our creative minds put together engaging art designed to drive actions. Our resident techs make it all function flawlessly. We build creative digital advertising solutions for small businesses that grab attention and inspire action. Website, Logos, and Digital Advertising, that's our thing. 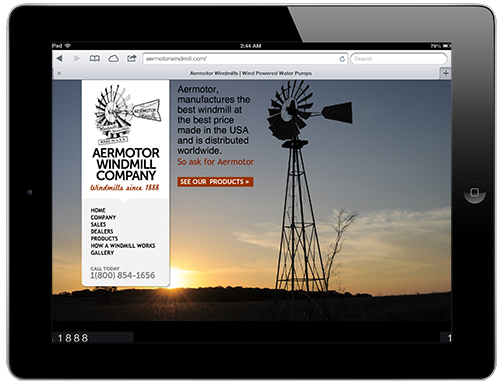 Aermotor Windmill runs on a century of tradition. eMediaStudios is a professional marketing and advertising company serving the Great Houston area. We specialize in building creative and engaging marketing campaigns designed to increase brand awareness, gain market share and drive revenue. For more information on how we can help improve your online presence, talk to us today. eMediaStudios partners with our clients to create unique and engaging custom website designs that capture the imagination and inspire action. Our custom websites are professionally built, fully functional and powered by industry leading content management systems. We Build Success. Our team of experienced professionals partner with your company to build a long term plan that leverages Social Media Marketing, Search Engine Optimization, Email Marketing and other digital marketing strategies to grow mindshare and increase engagement. Build your brand and focus your marketing efforts with a unified branding and marketing strategy. Create a seamless image that transcends boundaries and creates a focused message to increase consumer awareness, build loyalty and inspire consumer engagement. copyright 2012. eMediaStudios, LLC. All Rights Reserved.